Thankyou for allowing me to join your forum. I come from a place called Swannanoa in New Zealand. 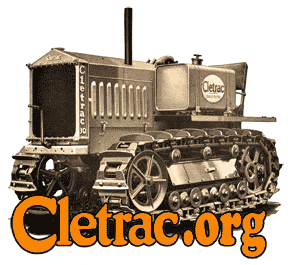 A friend has recently acquired an old Cletrac or Oliver crawler. On the manufacturer's plate it is a model ADHR or ARDH-sorry, not sure which. The serial number is 1DF.006. It doesn't seem to relate to any of the serial numbers in your list-it has a Hercules DOOC engine. I wonder if anybody would be able to help me get to the bottom of the model-I know ADs and ADHs are common, but what would the letter R denote. Thanks Hamish Petrie. This this crawler have regular steel tracks? They made an HG with rubber tracks that I think had an R in the model. Regular steel tracks, Doug. I wonder if it was a wartime model built by another manufacturer? I just received a message from someone in Western Queensland Australia who has a BDRH SN 1JM044 that they want to sell. This number does not match anything I have on my serial number lists, nor have I heard of a BDRH. Perhaps the "R" is unique to Australia and New Zealand? Thanks for your reply Blake.